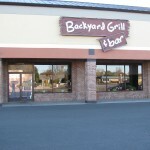 What is it that makes the Backyard Grill and Bar Special? It could be because our restaurant’s decor has a backyard feel, from the outdoor scenery painted on the walls to the garden hose that adorns it. We believe this helps to make customers to feel at home. Possibly it could be that we have specially made grills that cook over hickory wood. That’s where our name Backyard Grill came from. But we can’t forget that a restaurant isn’t just made up of food and drink. 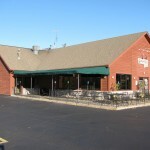 It takes people and we think it is because of our staff that our restaurant has a warm feel. Our Backyard has great employees with longevity. Many of our guests come in on nights that their favorite server or bartender is working. Most importantly it could be this: Backyard’s items that are prepared from scratch that we are most proud of. All of our restaurant’s burgers are hand-patted, the ribs are cooked from scratch and the barbecue pork is a homemade product as well. We are also proud of the fact that the Backyard is now cooking our own french fries. We are located at two different locations. Click the links below to see what each location has to offer.